Or Yehuda, Israel, May 9, 2016 – Magic Software Enterprises Ltd. (NASDAQ and TASE: MGIC), a global provider of mobile and cloud-enabled application and business integration platforms, announced today its financial results for the quarter ended March 31, 2016. Revenues for the first quarter increased 11% to $44.7 million compared to $40.3 million in the same period last year. Non-GAAP operating income for the first quarter remained constant at $6.7 million compared to the same period last year. Operating income for the first quarter decreased to $5.3 million from $5.8 million in the same period last year. 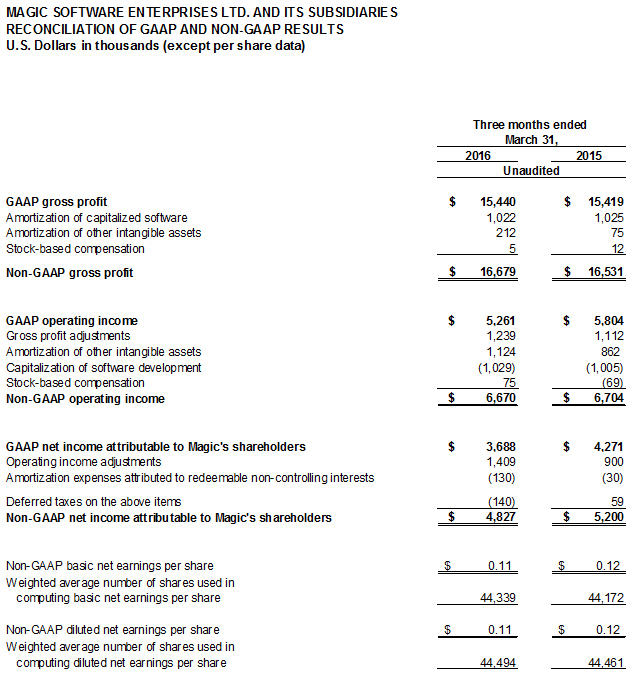 Non-GAAP net income for the first quarter decreased 7% to $4.8 million, or $0.11 per fully diluted share, compared to $5.2 million, or $0.12 per fully diluted share in the same period last year. Net income for the first quarter decreased to $3.7 million from $4.3 million in the same period last year. Net income was negatively impacted by increased tax expenses of $0.8 million. Operating cash flow for the quarter amounted to $11.2 million. During the first quarter, in accordance with our semi-annual dividend distribution policy, Magic distributed a cash dividend of $0.09 per share (approximately $4.0 million in the aggregate) with respect to its 2015 second half results of operations. As of March 31, 2016, our total cash, cash equivalents and short-term investments amounted to $81 million. 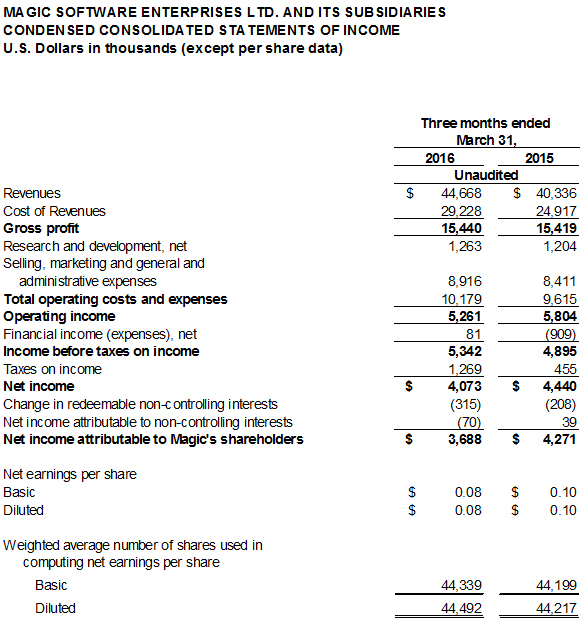 Magic is reiterating its fiscal year 2016 guidance issued in February for full year revenues between $191 million to $195 million on a constant currency basis. 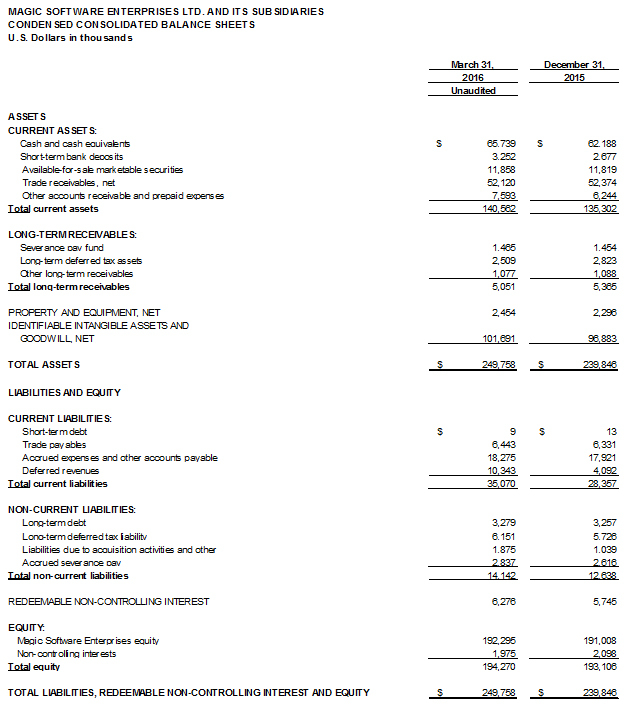 “Our financials remain strong. This quarter, cash flows from operations reached $11.2 million, contributing to our total cash position of $81 million,” added Bernstein. Magic’s management will host an interactive conference today, May 9, at 10:00 am Eastern Daylight Time (7:00 am Pacific Daylight Time, 17:00 Israel Daylight Time). On the call, management will review and discuss the results, and will also be available to answer investors’ questions. These non-GAAP financial measures are not in accordance with, or an alternative for, generally accepted accounting principles and may be different from non-GAAP financial measures used by other companies. In addition, these non-GAAP financial measures are not based on any comprehensive set of accounting rules or principles. 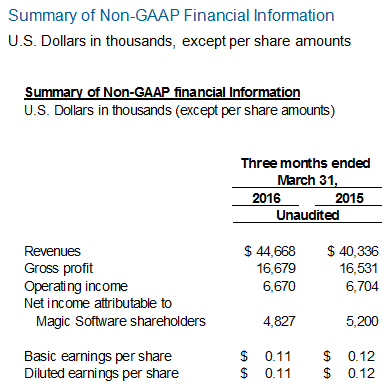 Magic Software believes that non-GAAP financial measures have limitations in that they do not reflect all of the amounts associated with the Company’s results of operations as determined in accordance with GAAP and that these measures should only be used to evaluate the Company’s results of operations in conjunction with the corresponding GAAP measures. Some of the statements in this press release may constitute “forward-looking statements” within the meaning of Section 27A of the Securities Act of 1933, Section 21E of the Securities and Exchange Act of 1934 and the United States Private Securities Litigation Reform Act of 1995. Words such as "will," "expects," "believes" and similar expressions are used to identify these forward-looking statements (although not all forward-looking statements include such words). These forward-looking statements, which may include, without limitation, projections regarding our future performance and financial condition, are made on the basis of management’s current views and assumptions with respect to future events. Any forward-looking statement is not a guarantee of future performance and actual results could differ materially from those contained in the forward-looking statement. These statements speak only as of the date they were made, and we undertake no obligation to update or revise any forward-looking statements, whether as a result of new information, future events or otherwise. We operate in a changing environment. New risks emerge from time to time and it is not possible for us to predict all risks that may affect us. For more information regarding these risks and uncertainties as well as certain additional risks that we face, you should refer to the Risk Factors detailed in our Annual Report on Form 20-F for the year ended December 31, 2015 and subsequent reports and registration statements filed from time to time with the Securities and Exchange Commission.